First early morning air-raid alarm is heard in London. Major Russian forces are close to being surrounded in the Bialystok area by Panzer units of Army Group Centre. Panzer Group 1 captures Lutsk and Dubno, in what was before September 1939 eastern Poland. The Red Air force launches an a number of air attacks against Finland’s airfields, in the hope of destroying German aircraft which were believed to be stationed in Finland. The RAF launches its third 1,000-bomber raid, with 1,006 aircraft against Bremen. This time Coastal Command provided 102 Hudson bombers, after Churchill’s insistence that they take part. As with the previous 1,000 bomber raids, a full moon had been selected to aid in finding the target. The raid caused heavy damage to the Focke-Wulf plant and devastated 27 acres of the inner city. The RAF lost 49 aircraft, a high proportion of them being manned by trainee crews. German troops drive a wedge into Sevastopol’s defenses. The Russians are running out of men, space and time. Surviving fighter aircraft are sent to the Caucasus, conceding the skies to the Luftwaffe. Soon the Russian AA guns are out of ammunition and the defenders face Stukas with rifles and machine guns. Artillery shells are running low too. The Germans capture Sidi Barrani, Sollum and the Halfaya Pass in Libya as the Eighth Army retreats to Mersa Matruh in Egypt. General Auchinleck relieves Lieutenant General Ritchie and takes personal command of the Eighth Army, with plans to hold Rommel if he could at Mersa Matruh, but more definitely at the El Alamein line, or if that failed the Suez Canal. 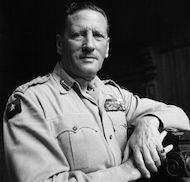 General Sir Claude Auchinleck replaces Lt. Gen. Neil Ritchie over British Eighth Army in Egypt. Newly built gas chamber/crematory III opens at Auschwitz. With its completion, the four new crematories at Auschwitz have a daily capacity of 4,756 bodies. The British Second Army begins a major offensive in the area of Caen ‘Operation Epsom’. After a naval bombardment, street fighting is reported in Cherbourg. General Koenig is appointed C-in-C of the Free French forces. The allies announce the division of Austria into four administrative zones. British Second Army in Germany is to be disbanded and sent back to Britain. The UN Charter is signed by representatives at San Francisco.